A former Michigan middle schoolteacher, Elizabeth Miklosovic, 37, taught for three years and was praised by school officials for her help in raising the test scores of her students. 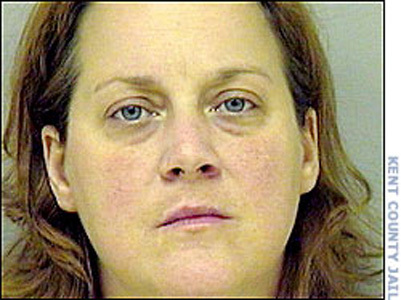 Then in January 2005, she was fired after being arrested for molesting a 14-year-old student. The victimized student told friends the relationship with the language arts teacher began when she was in the seventh grade. The information eventually reached school authorities and police and Miklosovic was arrested. Investigation into the relationship determined the former teacher assaulted her victim from June to August 2004. In June 2004, the victim's parents granted permission for their daughter to go camping with Miklosovic believing Miklosovic was a trusted mentor to their daughter. However, while camping the two lit candles, chanted and exchange vows in a pagan wedding ceremony. To solidify their union, they traded a piece of braided cloth. It was after the "wedding" that Miklosovic sexually assaulted her young victim. Authorities charged Miklosovic with three counts each of first-and second-degree criminal sexual contact. During the pretrial hearing the victim sobbed as she reluctantly recounted the relationship she had with her former teacher. She did not want to hurt Miklosovic and said many times she "couldn't do this" meaning, testify against the teacher, knowing her testimony would likely send Miklosovic to prison. The student testified, "She (Miklosovic) is a wonderful woman. She does not deserve this, any of this. I was not manipulated or taken advantage of. It was completely consensual." The family expressed Miklosovic had brainwashed the girl into believing no crime had been committed. In the best interest of the abused child, a plea deal was reached and Miklosovic pleaded no contest to two counts of criminal sexual contact, one is a first-degree count and the other a second-degree count. She was sentenced to five to 25 years in prison and avoided a jury trial which could have resulted in a life sentence. Before sentencing, Miklosovic's family asked for leniency because of she suffers from a life threatening medical condition and is in need of a double lung transplant. Comments to the judge before sentencing suggested Miklosovic was in denial about the crime she had committed. She told the judge, "The entire ordeal has been blown totally out of proportion for something that was innocent, kind and nurturing in nature." Tax Planning BasicsTop Tax SoftwareHow to Lower Your TaxesEasy Taxing Filing TipsNeed Help With Tax Prep?